It’s interesting, the way we casually adopt flower metaphors into our culture and language. Even those of us with no knowledge of, or interest in, poetry engage with blossoms as metaphors without a second thought. We buy flowers to say ‘sorry’, ‘congratulations’, ‘hello’, or to put on a grave as a mark of love or respect. Each November, we buy millions of poppies – real and manufactured – to acknowledge the dead of two World Wars (and more). A country’s youth might be referred to as its ‘flower’ – 'Flower of Scotland’ for example; we might refer to something or someone young and vigorous as in ‘full bloom’ or ‘blooming’ or ‘blossoming’; conversely, drooping sunflowers, with their (approximate) look of a human figure with its head hanging down, are sometimes used as a symbol of illness or death. So it is not just the bloom itself that has meaning, but also its condition. Flowers, with their rapid life cycle, become for us a distillation of the longer, but still sadly short, cycle of human life. And, of course, all of this finds its way into literature in countless ways. 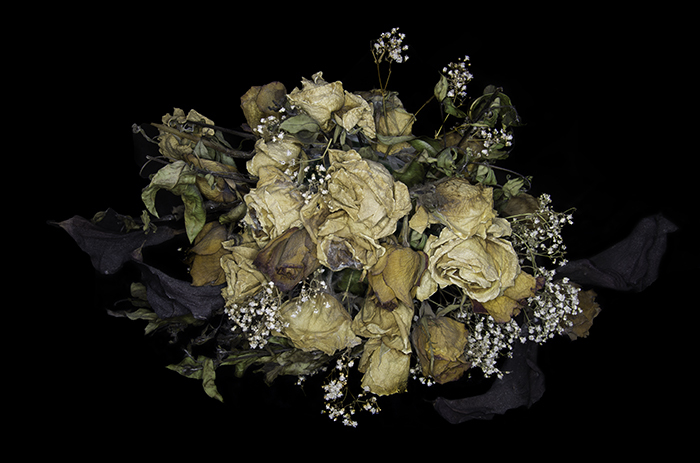 The flowers here – dried-up leftovers from a wedding – put one in mind of the gothic darkness of Miss Havisham’s wedding breakfast, from Charles Dickens’ Great Expectations (1861). For those who don’t remember the tale, Miss Havisham was jilted at the altar, and decades later she had still never taken off her wedding dress, and the wedding breakfast, complete with cake, was still untouched from the day it was set out and was rotting away under layers of dust and cobwebs. The wedding these flowers are from was a successfully conducted one – a happy affair – but nevertheless, the flowers have had their day and taken on new characteristics. I was also put in mind of another piece of literature: Baudelaire’s Les Fleurs du Mal (The Flowers of Evil - 1857). Controversial at the time, this is a collection of poems which describe the author’s disgust at the effects of modernisation on 19th century Paris. The works highlight prostitution, crime, gambling, sickness, anonymity and estrangement. As a body of work, the collection still has influence, providing song and album titles for contemporary rock acts, for example Marilyn Manson’s The Flowers of Evil from the album Born Villain (2012) and Therion’s album Les Fleurs du Mal (2012). The photograph itself was taken using a ring flash, to get that concentration of light at the centre. As a genre of photography, it might bear a relationship to product photography, though clearly no-one would wish to sell their products with such an image as its symbol. Such a photograph might have a use, however, for a record or book cover, where a dark visual metaphor might be highly appropriate.